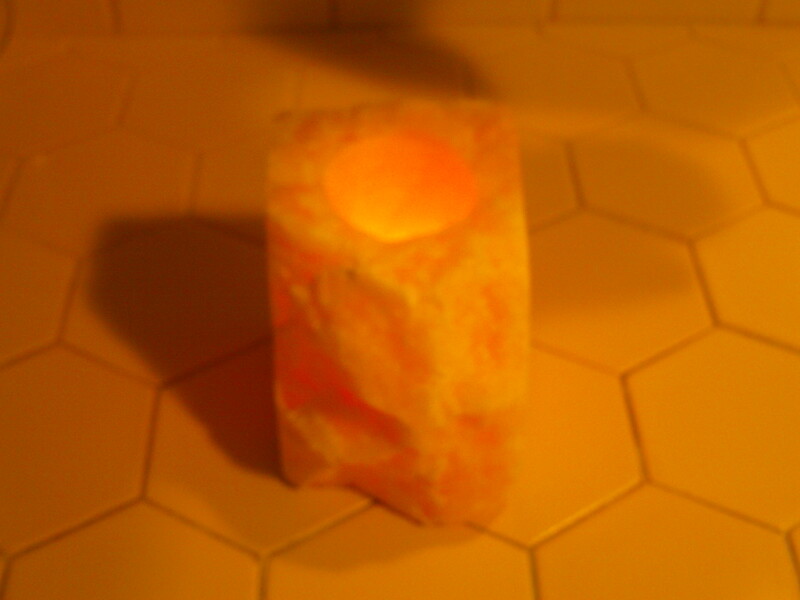 I light the small tea candle and let it slip down into the holder, which is of solid rose quartz. Once light has come inside, it has a very reddish hue. This beautiful candle was a gift to me when I became an Oblate last year at St. Placid Priory. Sr. Sharon, my Sister Mentor, named it my “Compline” candle, because it becomes enhanced in the darkness, and the orange-red glow colors the room. It reminds me of the infra-red side of the spectrum, of slowed-down light, “red-shifted”, invisible. The mind is quieted, open — as I am when singing the Office of Compline. Last Sunday morning the reading from Isaiah told of the land of Zebulun and Napthali (west of the Sea of Galilee), and how the people there “who walked in darkness have seen a great light” (Isaiah 9:1-2). Then the gospel (Matthew 4:12-16) related that Jesus, having heard of John the Baptist’s arrest, “withdrew to Galilee. He left Nazareth and went to live in the region of Zebulun and Napthali, that what had been said through Isaiah the prophet might be fulfilled.” Galilee was, in those days, a region of Judea whose inhabitants were a mixture of Jews and pagans, an area of peoples so diverse that it was called “the nations”. The season of Epiphany is all about light. It’s a natural thing for those of us in the Northern Hemisphere to be hungry for the light at this time of year; a friend at my office, has “seasonal affective disorder”, and needs a 30-minute blast of “white light” (ten times normal lumens) every day throughout the winter. Like dreams of sugar plums to the starving, images of light are associated with many events during Epiphany. At the beginning of the season, a star appears to the Magi, leading them to Christ, who is still called the “morning star”. On January 25 is the feast of the Conversion of St. Paul, when an intense light appeared to him on the road to Damascus at mid-day, with the voice “Saul, Saul, why do you persecute me?” — causing him to be blind for three days. And on February 2 is the Presentation of Jesus in the Temple; here the aged priest Simeon prophesied that Jesus would be “a light to enlighten the nations”. The feast, known also as “Candlemas”, was developed by the early church partly to build on pagan feasts of light. Obviously there’s a deep psychological need for light (and enlightenment) that these observances satisfy. I can never hear the Third Mode Melody without thinking of Ralph Vaughan Williams’s reworking of the tune into his Fantasia on a Theme by Thomas Tallis. I once saw a short film consisting of images of stars, galaxies and planets, with the Fantasia as background music. Here is a lovely two-part video of the piece, where the orchestra plays it in a darkened cathedral. But if I close my eyes and listen, I still see galaxies and stars. The rest of Compline last Sunday continued the feast of light with Psalm 27 (“The Lord is my light and my salvation—whom shall I fear?”); the hymn (“The people who in darkness walked have seen a glorious light”); the Nunc dimittis (“a light to lighten the Gentiles”); and the anthem (“Surge illuminare” – “Arise, shine, for thy light has come”). I hope you take some time to listen to them all and meditate on our wonderful gift of light. And burn a candle or two. Who knows, it may be as good as a 30-minute bright light treatment! Last Sunday found me singing Compline, but not with the Compline Choir in Seattle. My wife and I were participants in the 2011 Winter Chant Retreat given by the Center for Sacred Art. 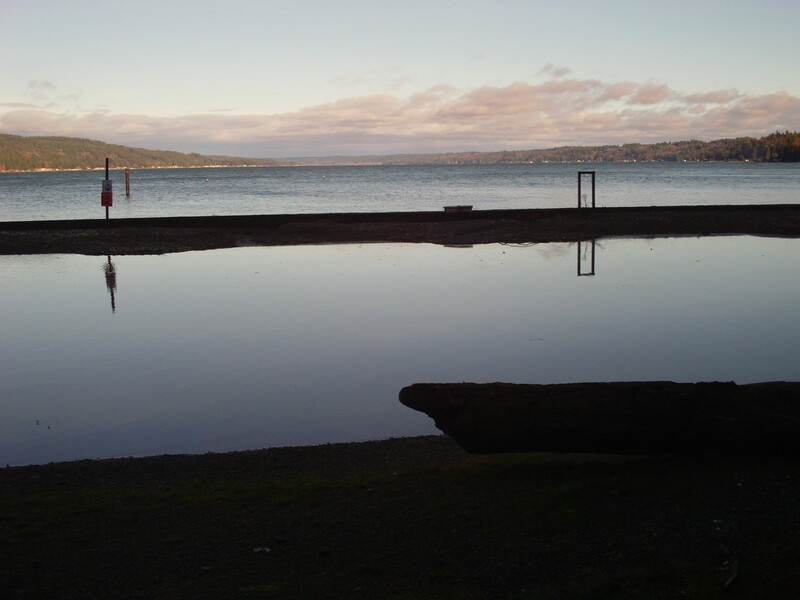 This annual event (there is also a Chant Retreat in July) takes place at St. Andrew’s House, an Episcopal diocesan retreat center on Hood Canal, a fjord that defines the western part of Puget Sound; it’s about two hours from Seattle. The picture was taken on Monday (Martin Luther King Day) as we were heading home. We stopped at Twanoh State Park for a sentimental visit, as I am from this area of the world; when I was in kindergarten I went wading in the little salt-water pool you see pictured in the foreground. Although the sun had come out, it was quite cold and windy, with glimpses of the Olympic Mountains — quite different weather than the steady rain during the first two days of the retreat. My wife and I had gone to the Chant Retreat in the Summer of 2007, so we knew what to expect, and were not disappointed. The retreat is built around singing the Divine Hours, and we sang the chant, in Latin, for eleven offices: Vespers and Compline on Saturday, Lauds-Terce-Sext-None-Vespers-Compline on Sunday, and Lauds-Terce-Sext on Monday. On Saturday we sang Vespers from the chants for the Virgin Mary; many of the people had been to Joseph Anderson’s workshops and knew these chants well, so this was a great way to jump-start those who had never sung a note of chant before. We met before and after Vespers to get ready for the next day’s chanting. The chants for the next two days were selected according to the theme of the retreat. In 2007 the theme had been St. Francis and St. Clare, but this time the theme was “The Contemplative Path”. Joseph, through music, and his wife Victoria Scarlett (who directs the Center), through several presentations of visual images, evoked the contemplative path in Christianity as well as other faiths. During our free time, the film Into Great Silence was shown (in two parts); I highly recommend it if you have never seen it before. Deus in adjutorium meum intende; Domine, ad adjuvandum me festina. (O God, make speed to save me; O Lord, make haste to help me). The first phrase (“Deus in adjutorium…”) is always said or sung by a leader or cantor, and everyone answers with the response “Domine, ad adjuvandum…”. This can get quite dramatic, as in the opening of concert performances of the Vespers (1610) by my favorite composer, Claudio Monteverdi (d. 1643). We really have St. Benedict to thank for including it at the beginning of every office. He mentions it in five different chapters of his famous Rule, including chapter 35, for those who begin their weekly service in the kitchen by saying “Deus in adjutorium…” three times. Obviously, St. Benedict was striving to teach his monks the importance of always relying on God for help, especially every time they prayed. The response is said or sung at the very beginning of every office except Vigils (Matins) at the beginning of the day, and Compline at the end of the day. Because Vigils comes after the “Great Silence”, it begins with “O Lord, open my lips, And my mouth will show forth your praise”. Compline, because it comes before sleep, “a little death”, begins “Turn us Lord to our health, And avert your wrath from us”. This last response is the monastic way of praying Compline, and most orders of Compline (which derive from the cathedral or parish form) don’t have it. The Order of Compline we use in Seattle comes from that used in the Church of England in 1928; here the Deuis in adjutorium is translated as: “O God, make speed to save us; O Lord, make haste to help us”. The archaic language gave me some amusement back in 1968 when I had to take a physical exam for the draft during the Vietnam war. I was lucky enough to have a knee injury that gave me a deferment, but I remember one of my college mates who resorted to taking an amphetimine (or “speed”) in order to fail the physical. “O God, make speed to save us” indeed! But now when I sing or say this little response, I know how important it was to the Desert Fathers and Mothers, Cassian, and Benedict — that when we ask God to be with us, we ask for it quickly, often, and right now! In the contemplative path, the only real time of importance is in the present moment, and this little mantra keeps us ever mindful. We’ve now moved into the liturgical season of Epiphany, which began on January 6 with the traditional celebration of the visit of the Magi, and lasts until Ash Wednesday. Epiphany will be long this year, since Easter won’t be until April 24. Jesus autem hodie regressus est a Jordanae (Jesus now returns today to the Jordan.) When Jesus Christ baptised was, the Holy Ghost descended with grace; the Father voice was heard in the place: Hic est filius meus, ipsum intende (This is my beloved Son). There were Three Persons and one Lord, the Son baptised with one accord, the Father said this blessed word: Hic est filius meus, ipsum intende. Now, Jesu, as thou art both God and man, and were baptised in from Jordan, at our last end, we pray thee, say then: Hic est filius meus, ipsum intende. In 1961 the British composer Peter Maxwell Davies wrote a setting of Jesus autem hodie, and I remember the Cathedral Choir at St. Mark’s, Seattle, singing this composition back in the late 1960s. Davies sets the first Latin text as a recurring refrain of high voices, while the narrative English sections and “Hic est filius meus” are sung by the full choir. The setting is very dense, dissonant, and difficult to sing — it takes an especially fine choir to bring it off, and you can hear such a performance (by the choir of the Church of the Advent, Boston) by clicking here. About twenty years after Davies, Peter Hallock wrote his setting of “The Baptism of Christ” (1980). He departs from the medieval form by having the first Latin phrase sung by the whole choir, but only once as a kind of introduction. Then the narrative English passages are sung by an alto voice, preferably a countertenor (male alto). Peter sang this himself for many years (his contribution toward the Early Music movement in America, and especially toward the acceptance of the solo countertenor sound, will have to wait for another blog entry!). The whole choir sings the “Hic est filius meus” section each time, holding the last syllable while the alto soloist echoes the words above – same with “ipsum intende”. Listen to it now from our podcast from January 9, 2011 (click on the “Play” button — “The Baptism of Christ” begins at about 21:40). I am always immensely moved by the simplicity of the writing, and the starkness of timbre of the countertenor, and also when the words of God are set to many voices instead of one. This representation of God by many voices makes it much more anonymous and mystical; many composers have used this technique, such as Benjamin Britten in his “Canticle II: Abraham and Isaac”, and Arnold Schoenberg in his opera Moses and Aaron. The effect in “The Baptism of Christ” is feeling of the words of God coming from the depths, underscored by the lower voicing, and then the alto voice sort of like a “hovering angel” above. Or is it the dove of the Holy Spirit? 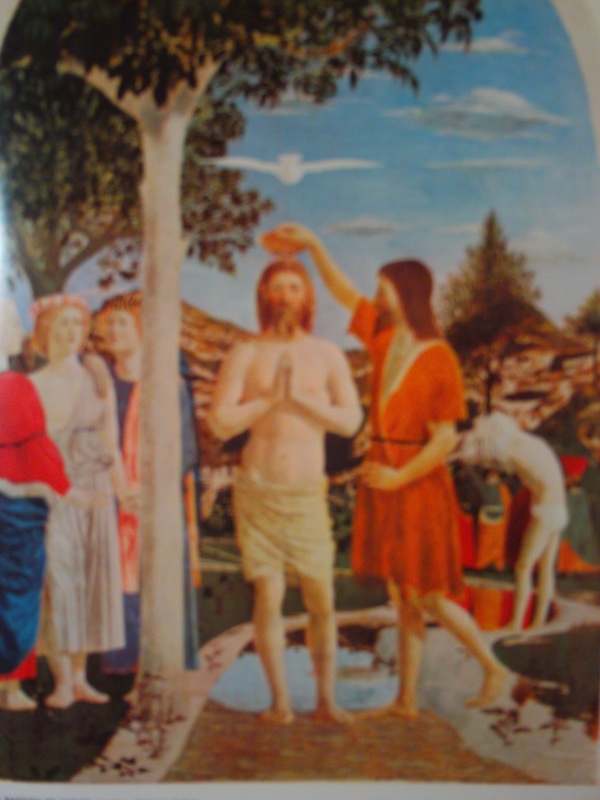 I am reminded of one of my favorite artists, Piero della Francesca, and his depiction of “The Baptism of Christ”. Here indeed, the Holy Spirit, in the form of a dove, hovers over Jesus. Welcome to the first edition of Compline Underground! I hope that this may be a meeting place for all who have an interest in Compline or Night Prayer, the last of the daily Divine Offices in the Christian Church. Whether you are actively involved in leading, assisting, or attending Compline in your church, monastery, or elsewhere –or especially interested in matters of music and spirituality — I think you’ll enjoy this reflective space. If you’re unfamiliar with Compline, just click on “About Compline Underground” at any time. I’ll try to throw in some history every now and then about the Office of Compline at St. Mark’s Cathedral in Seattle, where I’ve been singing every Sunday night since 1964 (except a few years off in the 1970s) – so if you do the math you will see that I have a fair amount of stories to tell. I’m collecting some of them into a book called Compline Reflections, which will include a CD packed with as much music as possible. And now on to the topic at hand. Last Sunday evening we sang the wonderful hymn “In the bleak midwinter”, to the melody by Gustav Holst. You can listen to it on our weekly podcast which just got posted (“The Office of Compline for January 2, 2011” – then click on the “Play” button — the hymn begins about ten minutes into the broadcast). Christmastide comes in the midst of the stillness, the utter bleakness of winter. It’s a definite change of season here in Seattle, even though we hardly get much snow. 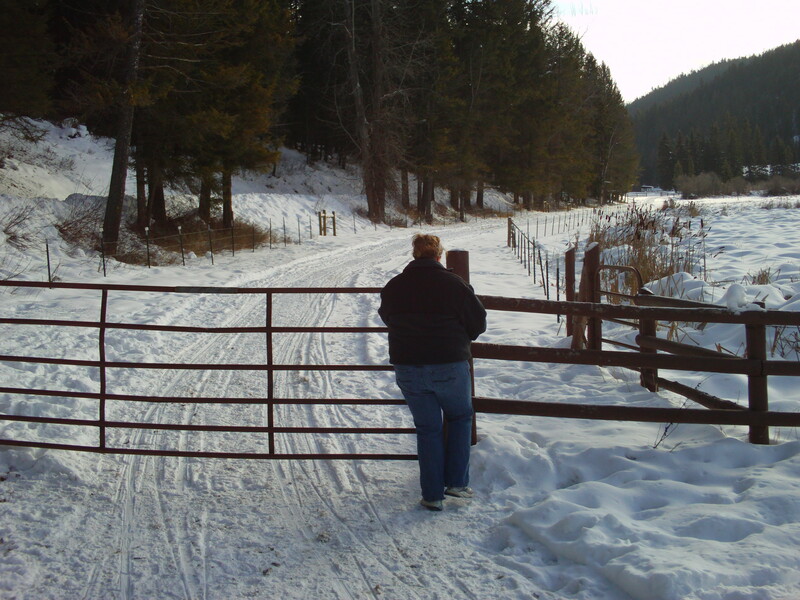 But for the New Year my wife and I went for a vacation trip on the train to Whitefish, Montana, which was impressive in its drifts with temperatures between five and minus-five-degrees. The picture, taken from a sleigh ride we went on, gives some indication of the great beauty when the world is covered in white. Yesterday I went out at about six a.m. to walk our dog. My wife usually does the morning stint except for Tuesdays, when she has to get ready for an early-morning session on a Hispanic talk show (she’s an immigration attorney). The temperature was still in the 20s, and because of Seattle’s closeness to the water, the “chill factor” was about the same as Whitefish. There was no rain, but it was quite foggy, with patches of frost on the ground. After a lifetime of singing, I am always reminded of some song or poem, and I kept thinking of a Christmas carol I had sung with an early music group back in the 1970s: “Past three o’clock, And a cold frosty morning, Past three o’clock, Good morrow, masters, all!” The carol reminded me of the cries of the night watchmen, whose profession I had recently been reading about in a book called At day’s close: Night in Times Past, by A. Roger Ekirch. I thought of how we no longer depend on someone appointed by the village or city to “orient” us, to keep us informed of the current hour through “the long watches of the night”. Our independence would be threatened, however, if the electricity failed, and our batteries ran out. If the land-line telephone was next to fail, we would have to go back to mechanical clocks and watches, which are seeming more like antiques every day. The subject of orientation came up for me recently when I saw a YouTube video of a wedding in which I sang almost a year ago at the Parish of the North American Martyrs, where I go on occasion to partake of the Latin mass (Tridentine Rite). I went from there to a link to an interview on Catholic Radio with the parish priest, Fr. Gerard Saguto. When asked why in the old rite the priest has his back to the people, he made an analogy to a bus trip, something like: “you would expect the bus driver to be facing the road, and not the passengers, wouldn’t you?” Here is a model where the priest, who makes the sacrifice of the mass on our behalf, is, as Fr. Saguto says, “leading us up to the Mount of Calvary”. It’s also a model which lends itself quite well to the hierarchical point of view, with all its flaws. But it was one of the models present in the early church, including one form of worship I read about that was based on the Jewish temple, with the altar in the west and priest facing east toward the people, except at one part when they also turned to face east — now my head was spinning! But I finally understood the ship analogy (remember the main part of the church is called the “nave”), because the priest, as “helmsman”, is behind the people! The modern Vatican II orientation (or some would say lack of it), especially when done “in the round”, reminds us to engage the other, living out Christ’s commandment that we “love one another”. At Compline in Seattle, Peter Hallock established from the earliest days in 1956 a kind of “orientation” for the choir, even when the office was sung in an empty cathedral. The choir has always sung from the back corner, so when one enters the cathedral, the altar is directly ahead, but the choir is to one’s right. The message is clear — the choir is not putting on a show or performance, but simply singing one of the monastic offices as its own act of devotion. The people that attend are “evesdroppers” as it were, and have no expectation laid on them, except to be in a state of “active listening” (or meditative silence). There is no one up front “leading” them.